During a personal meltdown in the late 1980s, I sought relief by submerging myself in books about various religions and philosophies. Instead of respite, I got mostly eyestrain and confusion. No offense to the Chinese, but how anyone reads the I Ching without cramming a chopstick in his brain is beyond me. The book that ultimately provided the most relief was a thin paperback called Zen Flesh, Zen Bones, filled with parables and abstract anecdotes; sort of like finding spiritual enlightenment via Cliffs Notes, but it worked for me. Maybe this is why I enjoyed Out Beyond Ideas so much. Folk singer-songwriter David Wilcox and his wife Nance Pettit collected ancient sacred poems from the world�s major faith traditions, set them to music, and sang them with a relaxed sincerity, a pleasing conduit for these messages of peace and love. The poems were written hundreds of years ago by mystics from various countries. Some don�t make obvious sense but are comforting nonetheless. It�s nice to know people from different generations, races, and cultures � from St. Francis of Assisi to Elvis Costello � have visualized peace, love, and understanding. The excerpts from the poems are succinct, so the album�s 17 songs flow from one to the next, easing the listener into a kind of mental hammock. Take, for example, a song called �The Shell Trick� translated from 17th-century Indian poet Takuram: �I saw God put himself in one of your pockets / It�s the old shell trick with a twist / You are bound to find him.� It�s a cool message sweetened by the realization that it was written in another age and repackaged in a modern context. Wilcox and Pettit aimed high and don�t always hit the mark. A few of the melodies are a bit vapid, and the production teeters toward pretentious at times. I wouldn�t put this on the same level as folkie Greg Brown�s Songs of Innocence and Experience (1986), a take on the poetry of William Blake. Still, Out Beyond Ideas is a refreshing listen, whether played simply as background music or when studied for its message. 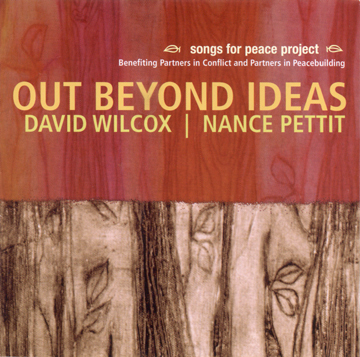 And, in the spirit of the album�s theme, proceeds from Ideas benefit international peace work. Fri at Bass Performance Hall�s McNair Studio, 301 E 5th St, FW. $27.50. 817-212-4280 or 1-877-212-4280.